On March 28, 2016, His Excellency, John, Bishop of Charioupolis has been nominated by the Extraordinary General Assembly of the Archdiocese of the Russian Orthodox Parishes in Western Europe, as their candidate at the election of the archbishop by the Holy Synod of the Ecumenical Throne. This year again, the beginning of the Great Fast is overshadowed by the dark clouds piling up over the head of humanity. Wars with all the accompanying human tragedies which they cause, pollution of nature, upheaval in the Middle East where we cannot yet understand either causes and outcome or the suffering of poor nations faced with the increasing gulf between North and South. The common man, for such we are, confronted with such an apocalyptic scenario, feels as weak as the grass of the fields. By the mercy of God, Archbishop of Constantinople-New Rome and Ecumenical Patriarch: grace, mercy, and peace to all the fullness of the Church from Christ, the Saviour born in Bethlehem. 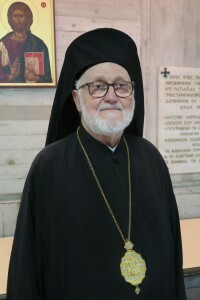 To the Reverent fathers, deans, clergy, priests and deacons, monks and nuns, the Council of the Archdiocese, the church institutions, the St Sergius Institute, to members of the laity with responsibilities, the faithful and friends of the Exarchate of Parishes of Russian Tradition in Western Europe of the Ecumenical Patriarchate.